On Sunday, Real Housewife of New York and potential sheeple Bethenny Frankel posted a photograph that threatens to tear the entire fabric of our society apart. “MoNa, i’m a big fan of ur work,” Frankel wrote in a caption of a photograph of a Hamptons sunset. But according to the comment section of the photo, it was either 1) Mother Nature, 2) God, or 3) NASA that is responsible for the blasphemy therein. Here’s what I learned. God is maybe real, or not real. God is a great artist. This is not God’s work it’s man’s garbage. 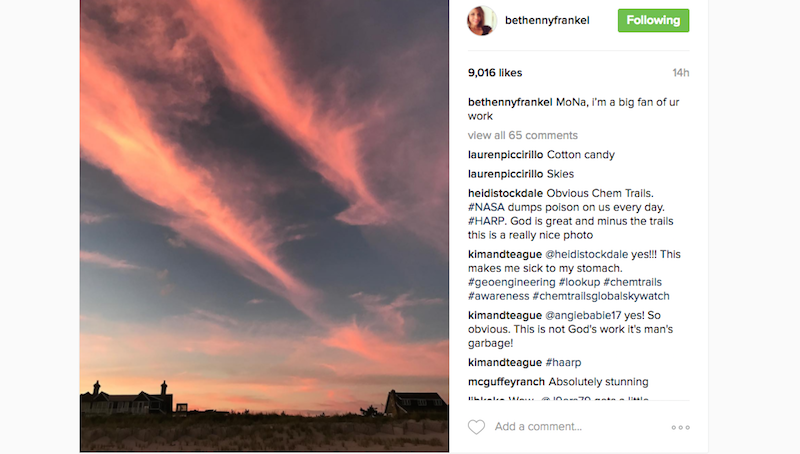 Whatever—I don’t know a blessed thing about chemtrails but here’s something I do know—Bethenny was very rude to Sonja this season!